Woot – Pearltrees 1.0 is now live! All the team is very happy to announce Pearltrees 1.0 with Pearltrees Premium. After months of hard work we’re delighted to introduce the best Pearltrees ever. For those of you that have been expecting privacy features they’ve finally arrived as part of Pearltrees Premium. Pearltrees 1.0 : your pearltrees… with a touch of magic! What makes Pearltrees magical is how easy it is to use wherever you are and how powerful it becomes when you discover and collaborate with others that share your interests. With 1.0, we wanted to provide a highly coherent and collaborative user experience, taking the best elements from the iPhone, iPad and web apps and integrating these improvements across all of Pearltrees. The first thing you’ll notice is the big pearl window. It displays content beautifully without changing the interface and makes browsing a pearltrees fluid, faster and more fun. However, beyond the addition of the big pearl window, you’ll discover hundreds of changes that will improve your experience… We will let you do so! Pearltrees Premium gives you even more. Many of you have been asking for privacy features. Pearltrees Premium delivers. As a premium member you’ll be able to create private pearltrees and manage the confidentiality of teams, you’ll also enjoy many other features reserved for premium members. Become a premium member and get more out of Pearltrees! Enjoy Pearltrees without any ads! 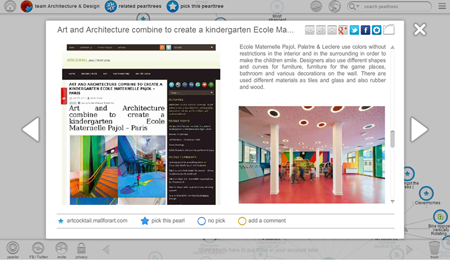 We’re very excited to offer you the latest version of Pearltrees, give it a try and let us know what you think! Something’s gone horribly wrong w/Pearltrees for me. Instead of showing the active site (in a Pearltrees frame) when I click the pearl, I get the “pearl” info window. I used to navigate all my regular blogs and webcomics from within PT, hitting the next/back arrows in the frame. Now, I can’t do that, which makes PT pretty darn near useless to me. I am using firefox, if that helps, with AdBlock and Ghostery. Ah, never mind. I just figured out you have to double-click. That’s the sort of think you might want to make very prominent when you do an upgrade like this. Lizard, thanks for the feedback. I’d love to hear more about your thoughts on this so I can better understand your experience. Can you email me? oliver dot starr at pearltrees dot com. I hate it. The ‘pearl window’ is clunky and annoying. What was wrong with one click taking us from tree view to web page? I do like the ‘new tab’ option, though. So i think if you doesn’t response this time to my post – i will leave pearltrees and tell my comments to facebook friends… sorry but i think a company which has like a vision that is powerful – and users stay behind them and WAIT ONE YEAR – don’t find it amazing that they NOW have to pay 45 EUR / year for PRIVACY >>>>> FOR PRIVACY not for GOLD! Hi James and thanks for the feedback. We have ma de a lot of users tests and it appeared that one click on a pearl taking people from tree view to web page was a painfull experience for a lot of people, especially beginners. This is why we have developped a big pearl window that enables to display content without leaving pearls. It has some advantages, you can browse a pearl content faster than loading web page after web page for example. We will continue to work on the way we display content and the general behavior of the pearl window of course. Please, can you write at feedback[at]pearltrees[dot]com what’s cluncky in your experience, thanks a lot. We’re glad that you find the new version amazing! In Pearltrees, everything is public by default : this is what makes it possible to discover amazing pearltrees related to your interests. This is also what makes it possible to collaborate with other people who share your interests, and organize great pearltrees together. Could we record our Pearltrees and show it on our PC without being connected with Pearltrees Premium ? I joined the premium member without hesitation in support of you guys great work! However, I am not an iOS user, and I still long for the andriod app. Thank you, and welcome in Pearltrees Premium! We are very impatient to enable Android users to have their library in their pocket too. I can’t tell you when it happens precisely, but be sure that we’ll do our best to make it happen as soon as possible. Pearltrees is quite interesting and magical to use as it combines the best elements from the iPhone, iPad and web apps to use. This is first time i have use this website and found very useful i find it very user friendly. I absolutely hate the fact that the default is no privacy. This is the exact opposite of what it should be. I should automatically have privacy, allow specific individuals to add to my Pearl Trees (as it is now), and have the choice to open my PTs up to the public. I have more privacy control on FB, and that’s not complementary to Pearl Trees. Having me pay to maintain my privacy seems to be extortion! I am now checking out Dropmark…..
Hi Michelle, the whole idea of Pearltrees rely on sharing the things you like. You let people see how you organize the tings you like so you can discover how other people have organized things about their passion. This is the reason why Pearltrees is public by default. Being private by default would have been a totally different idea. I stopped using Pearltrees a while back because I wanted private trees. They said wait. I check back now and they want money for the feature. Boo. Hi Bleth, why do you say “boo”. I fair. Pearltrees is a collaborative library, you share the topics you have organized and you can access what others have organized. If you don’t really wnat to share, you can contribute to the community by becoming a premium member. It’s fair !